There's been a lot of news about the lawsuits flying back and forth between Johnny Depp and his former business managers and Lisa Marie Presley and hers. I've often thought it would be great to have a business manager. They might keep me from buying one more pair of shoes and instead investing a bit more of my earnings. But the stories of the rich and famous who've put their trust in business and financial managers and been taken for millions (if not more) are too frequent to ignore. In addition to Johnny Depp and Lisa Marie Presley (I bet her managers would never have dipped into her fortune if Elvis was alive – I mean who would mess with Elvis' daughter?! ), Steven Spielberg, Leonardo DiCaprio, Ben Stiller, Sylvester Stallone, and more have been swindled by their managers or financial advisers. Then there's all the people affected by the infamous Ponzi scheme perpetrated by Bernie Madoff. In fact, let's start with the path of destruction Madoff set in motion. The Ponzi scheme instituted by Madoff will likely go down in history as one of the biggest financial scandals of all time. He had a deep client list comprised of the rich and famous and he also swindled pension funds, banks, and hedge funds that invested billions. All in all, his Ponzi scheme cost his clients $65 billion. While it might be natural to assume all of Madoff's clients had plenty of money and could afford to lose a little bit – well, that is simply not the case here. Madoff defrauded over $17 billion from thousands of clients – many of those clients were charities, public endowments, and individual retirement accounts with modest amounts of money in them. The family who own the New York Mets lost $300 million. A private banker placed $10 million of one of his client's money into Madoff's fund just before the Ponzi scheme was revealed – decimating not only the client, but the banker's working reputation. Another family had $100 million invested with Madoff. Too many people to count lost everything, including the octogenarian model Carmen Dell'Orefice, whose entire savings was wiped out by Madoff's scheme. She had to return to modeling work in her 80s just to survive. Among the celebrities who invested with Madoff were Kevin Bacon and Kyra Sedgwick, John Malkovich, and screenwriter Eric Roth. All of them lost millions of dollars. A charity set up by Steven Spielberg was also a victim of Madoff. The Wunderkinder Foundation had 70% of its funding wiped out. 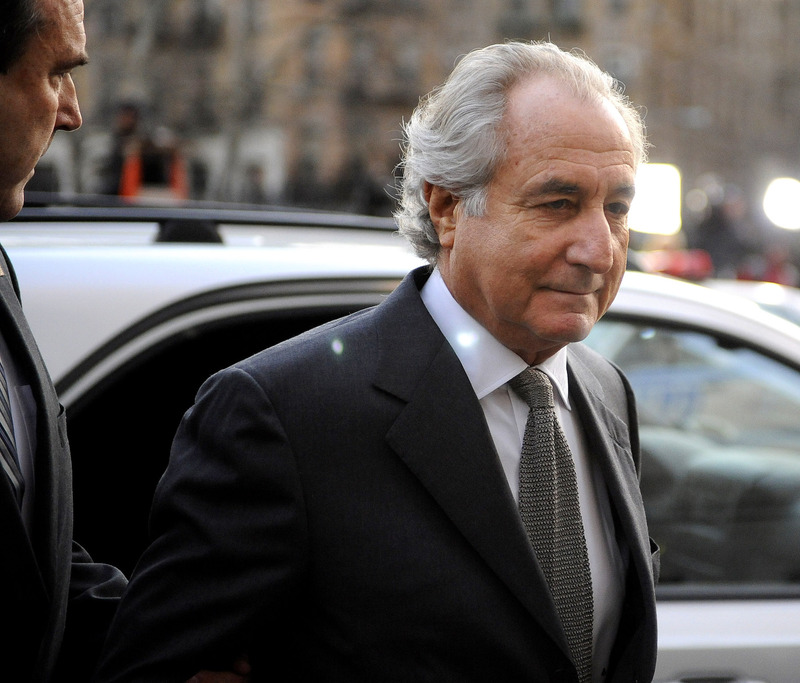 Bernie Madoff is currently serving a 150 year prison sentence. The name Dana Giacchetto may not mean anything to people today, but in the 1990s, he was called the "stockbroker to the stars" and was the go-to advisor for many of Hollywood's A-listers including Leonardo DiCaprio, Ben Affleck, Cameron Diaz, Ben Stiller, REM's Michael Stipe, and Creative Artists Agency founder and former studio executive Michael Ovitz. He wasn't just the stars' stockbroker, he also partied with them. He even claimed, in a Billboard Magazine article that DiCaprio based his Wolf of Wall Street character partly on him. Giacchetto was flying high until 2000, when he was arrested for the theft of about $10 million from his clients. He served 57 months of his sentence and was released on good behavior in 2003. He was never able to recapture his earlier success. In 2014 he was charged with wire fraud. In 2014, he was found dead in his apartment. He was 53 years old. First of all, this Kenneth Starr is no relation to the special prosecutor Kenneth Starr who made the Clintons' life in the White House more difficult. This Kenneth Starr was a trusted financial advisor to the Hollywood elite. His client list included Martin Scorsese, Al Pacino, Sylvester Stallone, Wesley Snipes, Barbara Walters, Caroline Kennedy, Mike Nichols and Diane Sawyer, Nora Ephron, Tom Brokaw, Frank and Kathie Lee Gifford, and oh so many more. Starr stole $59 million from his clients and reportedly spent $30 million of it on a large condo in Manhattan with an indoor swimming pool on the Upper East Side. Starr used his access to his famous clients to establish an image of trustworthiness. This led his clients to hand over control of their financial affairs to Starr. There were earlier signs of trouble. Sylvester Stallone sued Starr for fraud in the 1990s, saying that the famed advisor told him to hang onto his Planet Hollywood shares as the restaurants was about to go bankrupt. At the same time, another of Starr's clients, Planet Hollywood founder Keith Barish was selling his stock in the company as fast as he could. Stallone and Starr settled out of court. Starr was sentenced to seven and a half years in prison for his crimes. He was also required to pay back more than $29 million to his clients. He was released from prison in December 2016.